Divorce Soup | Kitchen Mischief! « Coming Soon: Kitchen Mischief Pasta Week! Hold on, don’t get your aprons in a wad when reading the title. This soup will not cause a break in your holy vows, but rather this is my game plan for this well-known soup. While battling wretched sinus stuff, I decided I needed a little chicken soup to soothe and comfort, so I turned to my culinary nurse, Ina Garten, (and secret love – ah, hell, it’s no secret) for some ideas. 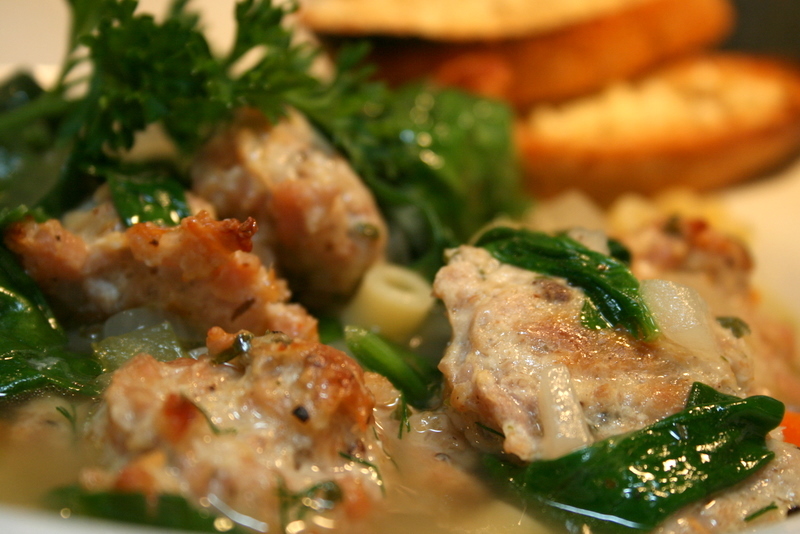 Low and behold, something caught my eye – Italian Wedding Soup made with chicken meatballs. I was feeling better already. After making this rather easy soup, I realized that the actual soup part was okay; what stood out was the chicken meatballs. 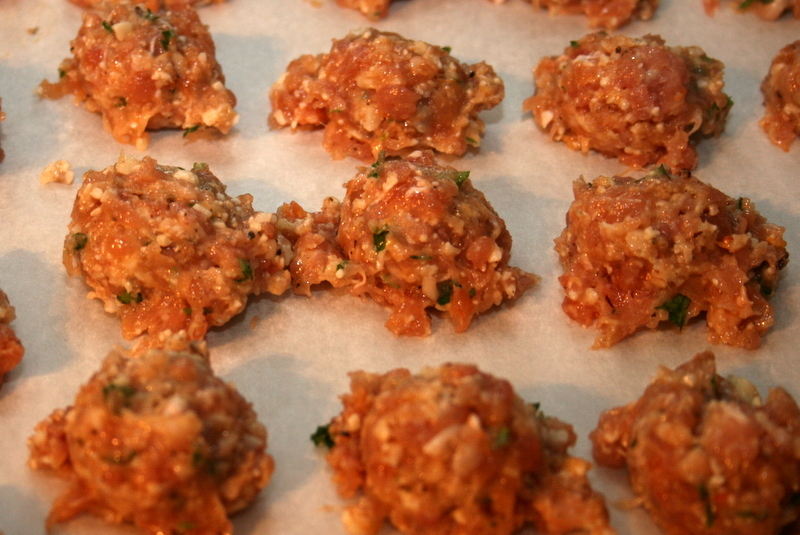 These tasty balls of culinary goodness were the absolute star of the dish. I had to stop Ray and myself from eating all of them to save some for the soup. So today I will provide the recipe for the soup, because it’s worth trying; but at the end I want to split these little jewels up from their soup-based bride and set them free to be a culinary bachelor again. FYI – Like I said, the soup was okay so I had to add a few more ingredients than Nanny Ina to boost the flavor a little. In the meantime, for the soup, heat the olive oil over medium-low heat in a large heavy-bottomed soup pot. 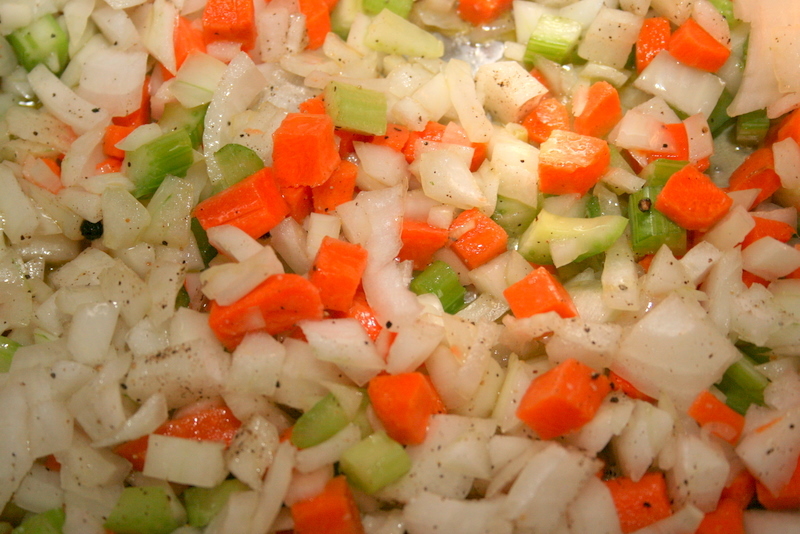 Add the onion, carrots, and celery and saute until softened, 5 to 6 minutes, stirring occasionally. Add the chicken stock and wine and bring to a boil. 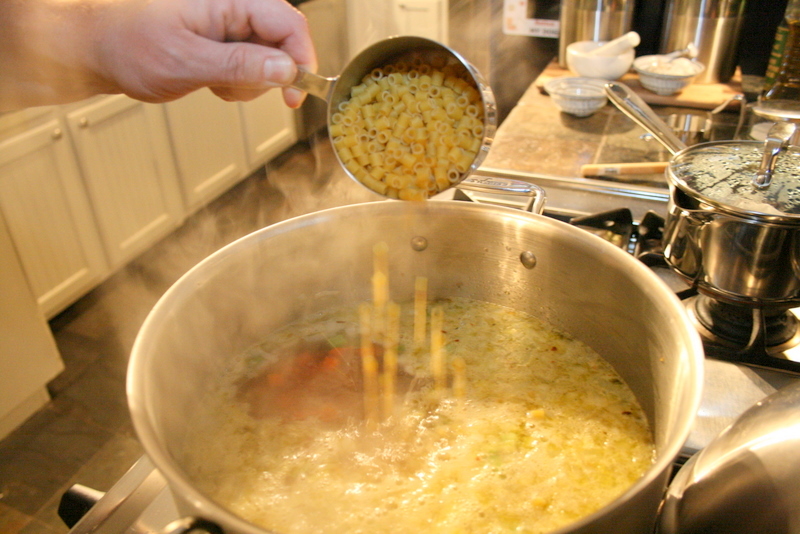 Add the pasta to the simmering broth and cook for 6 to 8 minutes, until the pasta is tender. Add the fresh dill and then the meatballs to the soup and simmer for 1 minute. Taste for salt and pepper. Stir in the fresh spinach and cook for 1 minute, until the spinach is just wilted. Ladle into soup bowls and sprinkle each serving with extra grated Parmesan. 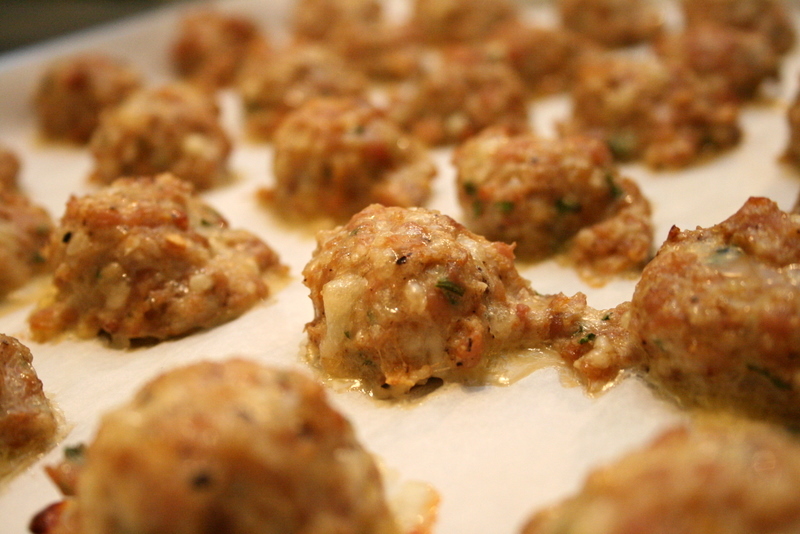 Meatball Sub – My friend Jamie gave me this idea – use the chicken meatballs in a sub sandwich. Place meatballs on a sub roll, cover in marinara, add mozzarella cheese and melt under the broiler. Chicken Lasagna – Use the chicken meatball mixture as the meat for your next lasagna, then invite me over to eat it! 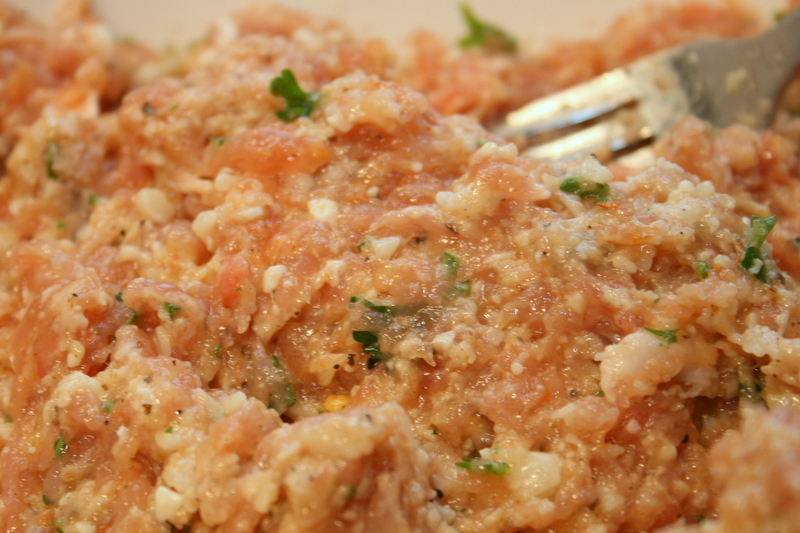 Ravioli – Cook the meat mixture and use as the stuffing for your ravioli…again, invite me over the eat it. As with any post, mischief may prevail. Below is an example of what NOT to do. I was baking my bread to go with my soup and realized it was taking way to long, so I turned on the broiler. 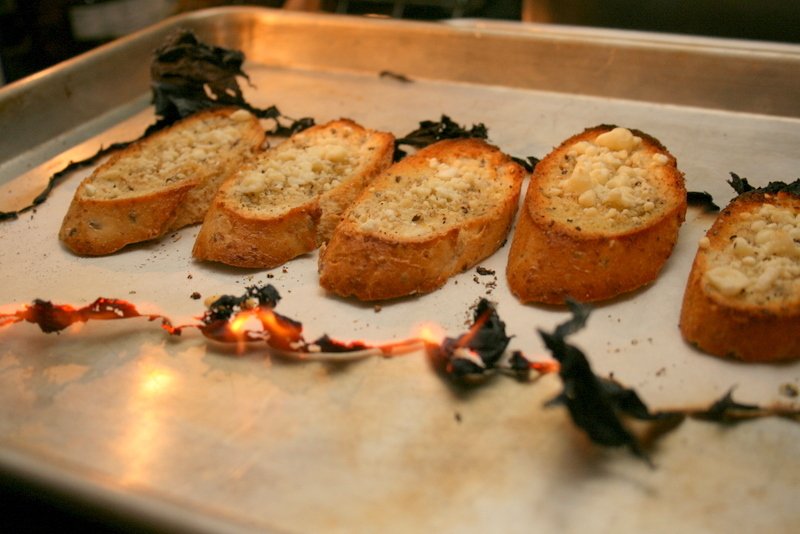 I totally forgot that I had lined my pan with parchment paper and as a result had flambé bread. This entry was posted on October 20, 2010 at 3:15 pm and is filed under Recipe, Story, Tips. You can follow any responses to this entry through the RSS 2.0 feed. You can leave a response, or trackback from your own site. My favorite soup of all time. Good Job. Yum Yum Yum I’m making them this weekend!